Jerry Barksdale Byrd, Sr. (October 4, 1935 – April 21, 2016), was a legendary sportswriter for the now defunct Shreveport Journal in his native Shreveport, Louisiana. He covered sports for the newspaper from May 29, 1957, beginning the morning after his graduation from Northwestern State University in Natchitoches, Louisiana. He remained with The Journal under two different long-term publishers, Douglas Fisher Attaway, and Charles Thomas Beaird (1922-2006), until the paper ceased daily operations on March 30, 1991. Byrd was the second of four sons of Frank Carl Byrd (1909-1988), a native of Ajax in Nathitoches Parish, and Frank's second wife, the former Annie Laura Allen (1916-2000), a native of Hosston, north of Shreveport in Caddo Parish. She was the daughter of John Cook Allen (1886-1916) and the former Martha Amanda Wynn (1886-1978). Annie's father died twenty-four days after her birth; her mother was a widow for sixty-two years. Jerry Byrd was born in 1935 at Schumpert Hospital in Shreveport with a cleft lip and palate. He hence stuttered and for many years avoided public speaking. His first newspaper entry was a letter to the editor of The Shreveport Journal, then Douglas Attaway, Sr., published in December 1948, in which he discusses his recent Boy Scouts camping trip. He first attended C. E. Byrd High School in Shreveport and Bossier High School in Bossier City before he transferred for the eleventh grade to the since defunct Fair Park High School, at which he received more assistance to overcome his speech difficulties. He became the sports editor of the student newspaper, The Pow Wow, and graduated in May 1953 from Fair Park, located near the grounds of the Louisiana State Fair. With the help of Antoinetta Tuminello, his journalism teacher at Fair Park, he began his eventual mastery of sports writing. He was subsequently sports editor of the Northwestern State University Current Sauce college newspaper. He managed the NSU Demons basketball team coached by future 1969 Louisiana Sports Hall of Famer "Red" Thomas. His NSU colleagues called Byrd "Tweety" after the Walt Disney cartoon character. He had a visibly large head and was bald most of his adult life. In 1965, Byrd married the former Patricia “Pat” Ann Hood. Their two children are Tricia Hagan and Jerry Byrd, Jr. (born January 1973), an educator, and his wife, Amanda, of Shreveport. After Pat's death in 2001, Byrd was reunited in June 2003 with Barbara Crouch Copeland (born November 1934), whom he had known from Fair Park High School from 1952 to 1953. The couple wed two months later. Byrd's brothers are Ronald James Byrd and wife, Donna; John Alan Byrd (born February 1940) and wife, Delaine, of Shreveport; and Thomas Everett Byrd and wife, Kay. Byrd began with The Shreveport Journal at a salary of $35 to $40 per week, an amount his family thought huge in that day. He wrote a column for 2,131 consecutive editions of The Shreveport Journal, excluding vacations and interrupted by a bout with gallstones but long enough to match Lou Gehrig's New York Yankees consecutive-game streak from 1925 to 1939. 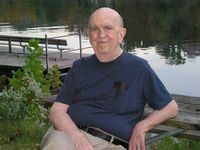 Byrd was The Journal sports editor beginning in 1970 for nearly twenty-one of his thirty-four years with the publication. Afterwards, he wrote in 1991 and 1992 for the Minden Press-Herald in Minden in Webster Parish and the Bossier Press-Tribune in Bossier City from 1993 to 2012. He continued his column The Press-Tribune until 2013. Byrd was a "hands-on" editor who snapped up details, such as making sure the sports photographers took a picture of the final tallies on the basketball scoreboard and that Bossier High School, which he had attended in his sophomore year, had two gyms used for basketball tournaments. He penned six books, beginning with Jerry Byrd’s Football Country, a publication loaded with sports records, facts, and events that many would have otherwise forgotten. He was a pioneer in the coverage of African-American athletes, such as baseball players Vida Blue, originally from DeSoto Parish, south of Shreveport, and James Rodney Richard at the former historically black Lincoln High School in Ruston. Byrd was the first white sportswriter to cover all-black teams in Shreveport-Bossier City during the era of segregation. His second book, Louisiana Sports Legends, published in 1992, examines the achievements of the first 145 members of the Natchitoches-based Louisiana Sports Hall of Fame. In 2002, he published Louisiana's Best in High School Football: Stories of the State's Greatest Players, Coaches, and Teams. Byrd himself was a member of the Louisiana Sports Hall of Fame, an honor which he received based on his receipt in 1996 of the "Distinguished Service Award in Sports Journalism" from the Louisiana Sportswriters Association. In 1992, the Louisiana Association of Basketball Coaches named him “Mr. Louisiana Basketball”. In 2005, the "N-Club" at Northwestern State University presented him with another "Distinguished Service" award. He was similarly honored by Louisiana Tech University in Ruston and the Louisiana Track and Field Coaches Association. He was a charter member of the North Louisiana Track and Field Hall of Fame and an inductee of the Ark-La-Tex (Arkansas, Louisiana, Texas) Sports Museum of Champions. He won more than fifty writing awards and was honored by the Associated Press, United Press International, the Society of Professional Journalists (Sigma Delta Chi), and the Louisiana Press Association. For two decades, Byrd coached the Shreveport city swim team, one of the best in statewide competition. He organized junior track and field athletes and carried them to meets throughout the region and nation. He also had a penchant for singing all kinds of tunes, often at odd times. Any way you measure -- longevity, quantity of work, quality of work -- there has never been a better sportswriter in Shreveport-Bossier (and arguably not in the state of Louisiana) -- than Byrd. He is the man. He's been a role model for me, and he's done so many personal favors ... He as written, fearlessly and endlessly, on thousands of subjects and people. Sure, he was outspoken and opinionated. But he did it without suggesting that coaches be fired or programs be overhauled or crusading against the National Collegiate Athletic Association (well, not often). He was as honest as he could be. I've met few people more determined, more strong-willed, more capable. Byrd is a perfectionist, and his copy -- with very few typos or dropped words or fact errors -- reflected that. No one worked harder for those honors and awards, or deserved them more. John James Marshall worked with Byrd on the sports desk of The Shreveport Journal for a decade. He recalled, "You never knew what would happen when the boss walked into the room. He might break out into a song or slam down the phone on some college coach. He was a walking encyclopedia and was a mentor, a father-figure, to me." Stanley Ray Tiner (born 1942), a former editor of The Shreveport Journal who later for many years edited The Sun Herald on the Mississippi Gulf Coast, once described Byrd as “one of the great treasures of North Louisiana.” The occasion for Tiner's remarks was the Jerry Byrd Roast benefiting Special Olympics and the Shreveport Track Club. Grieved over Byrd's passing, Shreveport sports legend Terry Bradshaw said that he "loved" the sportswriting legend. Byrd, who was a Christian, died of natural causes at the age of eighty. He will be interred on April 25, 2016, at Sharon Cemetery in eastern Claiborne Parish. ↑ 1.0 1.1 1.2 1.3 Jerry Byrd. Osborn Funeral Home. Retrieved on April 24, 2016. ↑ Frank Carl Allen. ancestry.com. Retrieved on April 24, 2016. ↑ Annie Laura Allen. ancestry.com. Retrieved on April 24, 2016. ↑ 4.0 4.1 4.2 4.3 4.4 Jimmy Watson (April 21, 2016). Updated: Hall of Fame sportswriter Jerry Byrd dies. The Shreveport Times. Retrieved on April 22, 2016. ↑ 5.0 5.1 5.2 5.3 Services set for legendary sportswriter Jerry Byrd. The Shreveport Times. Retrieved on April 22, 2016. ↑ 6.0 6.1 6.2 6.3 6.4 Nico Van Thyn (June 8, 2012). Once a Knight: The legendary man, Mr. Byrd. nvanthyn.blogsport.com. Retrieved on April 22, 2016. ↑ 7.0 7.1 Randy Brown (publisher of the The Press-Tribune) (November 26, 2014). Opinion: Working with Jerry Byrd. Bossier Press-Tribune. Retrieved on April 24, 2016. ↑ "Byrd named sports editor", Minden Press-Herald, June 30, 1991, p. 1. ↑ 9.0 9.1 Iconic Shreveport sports journalist Jerry Byrd, Sr., passes away. KTBS-TV (April 21, 2016). Retrieved on April 22, 2016. ↑ Jerry Byrd (2002). Louisiana's Best in High School Football: Stories of the State's Greatest Players, Coaches, and Teams 448. Xlibris. Retrieved on April 24, 2016. ↑ Russell Hedges (son of Louisiana Sports Hall of Fame Coach Lee Hedges) (November 26, 2014). Living Legend: Celebrating Jerry Byrd’s contribution to sports, BPT. Bossier Press-Tribune. Retrieved on April 22, 2016. ↑ Terry Bradshaw says he 'loved' Byrd. The Shreveport Times. Retrieved on April 23, 2016. ↑ Sharon Cemetery. Findagrave.com. Retrieved on April 24, 2016. This page was last modified on 25 March 2019, at 18:55.